A nutritional powerhouse, kale is low in calories, with each cup contributing just 33 calories to your daily intake. Kale is also loaded with essential nutrients. For example, just a single serving of kale provides all the vitamin K you need for the day, and eating kale also boosts your intake of calcium and iron. Making kale a regular part of your diet not only promotes overall health; it also keeps your skin healthy and strong by increasing your intake of skin-friendly essential nutrients. Kale boosts the health of your skin because of its vitamin C content. Your skin contains collagen fibers, which are long strands of protein that form a network that holds your skin cells together. Vitamin C helps you make the collagen needed for skin strength. Conversely, low vitamin C intake prevents collagen production, which weakens your skin and causes tears. Vitamin C's antioxidant function also means it might provide natural protection from the sun, preventing skin damage caused by exposure to the sun's rays. A cup of raw kale contains 80.4 milligrams of vitamin C. This provides 90 percent of the recommended daily intake for men and the entire recommended daily vitamin C intake for women. Kale also comes packed with skin-friendly copper. This mineral boosts the synthesis of melanin -- a pigment that protects your skin from the sun -- and, like vitamin C, it helps you make collagen. It controls inflammation, and might offer anti-inflammatory benefits for your skin, and copper-dependent enzymes also play a role in wound healing. 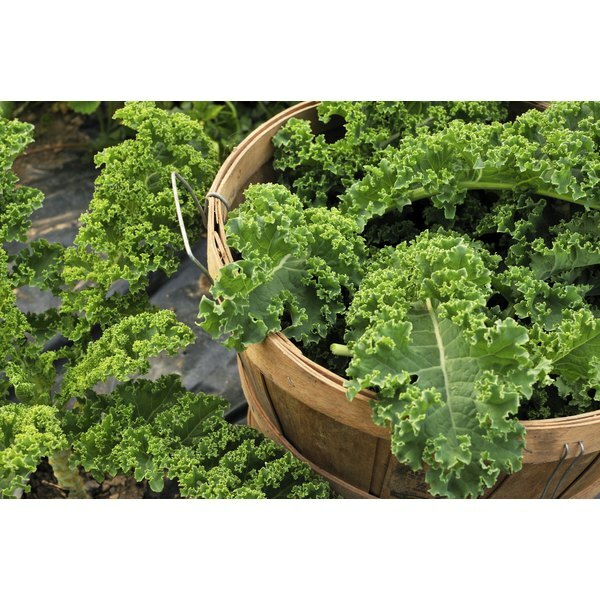 Each cup of raw kale boasts 1,004 micrograms of copper, which is more than the 900 micrograms you need daily. Kale also benefits the health of your skin by boosting your vitamin A intake. A 1-cup serving of raw kale provides you with 335 micrograms of retinol activity equivalents, which makes up 37 percent of the recommended daily vitamin A intake for men and 48 percent for women. Vitamin A promotes healthy cell growth, including the cells that make up the dermis and epidermis of your skin. Low vitamin A levels affect the cellular makeup of your skin, causing healthy skin to be replaced by dead skin cells, and also negatively affects your oil and sweat glands. Kale's hearty texture stands up well to cooking. Try braising it in vegetable broth, lemon juice and olive oil, or steam it until tender, adding minced garlic for flavor. Alternatively, add a handful of kale to your favorite soups a few minutes before serving -- the leaves will wilt and add texture, as well as nutritional value, to your meal. Enjoy kale raw by allowing it to "marinate" in salad dressing. This helps make the leaves more tender, and also helps cut kale's naturally bitter flavor. A mixture of lemon juice, tahini and garlic works well as a flavorful-but-healthy dressing for raw kale salad.